Last Friday I had that end of week feeling. You know the one that starts about an hour before you’re off work on Friday. It happens whether your Friday is actually Friday or another day. At the time my mind was wandering, thinking about sitting outside drinking a nice cold beer. Once I got home my wife and I decided to walk over to Alu for some wine, beer and great food. By now Eliot residents should have received their new recycling roll carts. You should have gotten a large green one for yard debris and a large blue one for plastic, paper and metal. Now that you have them, how do you use them most effectively to reduce reuse and recycle? In November Volunteers of America Men’s Residential Center announced they were collecting returnable cans and bottles. The proceeds are used for a scholarship fund for Portland area high school students. The program has been a success and continues. If you were out and about the morning of Sunday June 29th you may have noticed a house on NE Martin Luther King Boulevard. 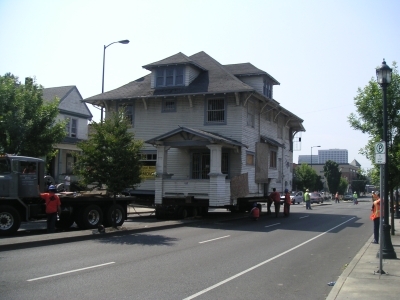 Not a house along MLK but a house in the middle of the road!